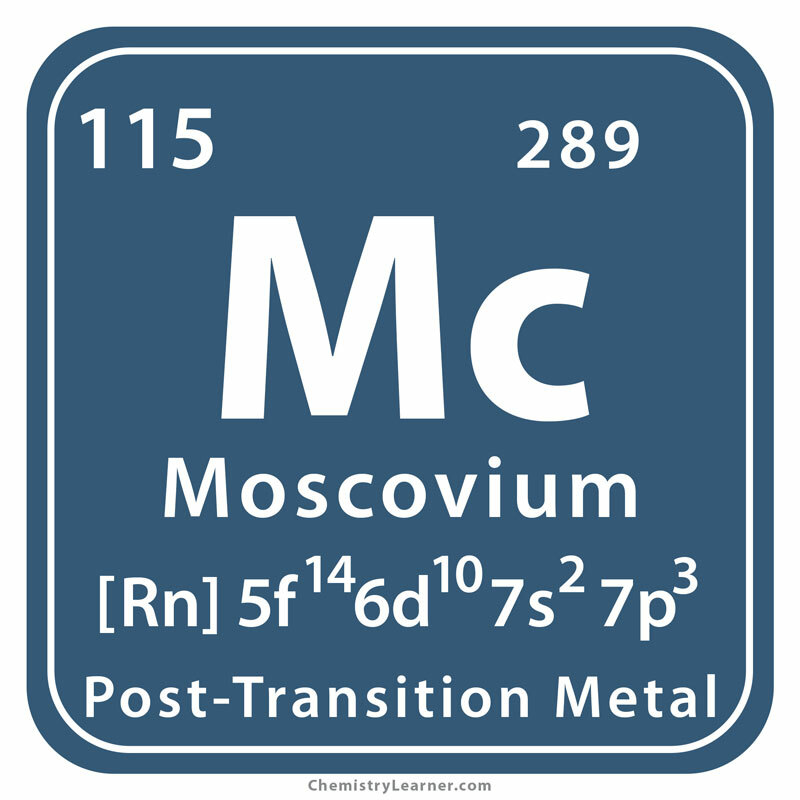 Moscovium (pronunciation: moss-KO-vee-um) is a synthetic , highly radioactive metal  that probably belongs to the post-transition metal family , represented by the chemical symbol Mc . It has 4 isotopes, the most stable one being Moscovium-289 with a half-life period of 220 milliseconds [4, 5]. It undergoes radioactive disintegration through α decay to form nihonium-285 . Origin of its Name: Its name is derived from the Russian capital Moscow, where the JINR (Joint Institute of Nuclear Research) is located . Who discovered it: A team of researchers from the Lawrence Livermore National Laboratory (LLNL) in the USA, Oak Ridge National Laboratory (ORNL) in the USA, and the Joint Institute for Nuclear Research (JINR) in Russia, headed by the nuclear physicist Yuri Tsolakovich Oganessian . In a sequence of experiments carried out between 14th July 2003 and 10th August 2003 by the scientists from the ORNL, JINR, and LLNL at the JINR in Moscow, americium-243 atoms were bombarded with calcium-48 ions using a cyclotron . 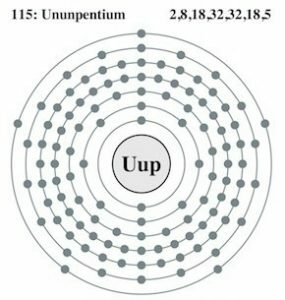 On 2nd February 2004, the team of researchers announced the creation of the chemical element 115 , giving it a placeholder name Ununpentium with the symbol Uup . 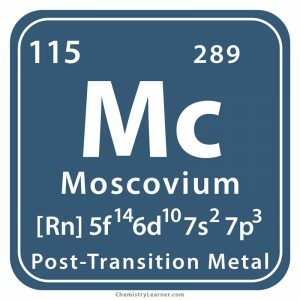 The IUPAC acknowledged the discovery of the new chemical element in 2015  and accepted the name Moscovium in 2016 . 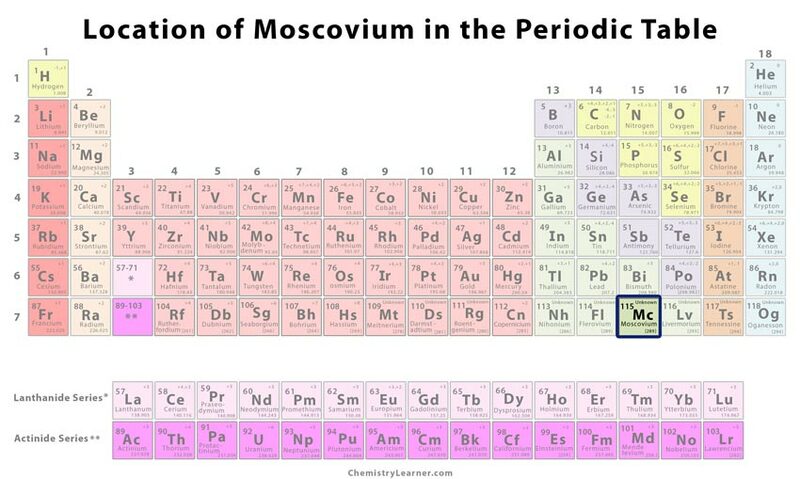 Since Moscovium does not occur naturally and has been produced in limited amounts, the element is currently used only for research [2, 4]. Nihonium, the element created after the radioactive decay of Moscovium, also has no uses except in scientific studies . 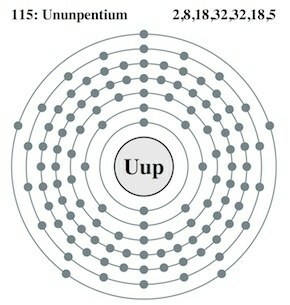 The placeholder name Ununpentium, meaning one-one-five in Latin, indicates the element’s atomic number 115 . In 1989, the “mysterious element 115” was claimed by the Area 51 whistleblower Bob Lazar to have been used as a source of power in the UFOs and spaceships that he believed were possessed by the US government. Naturally, his claims were considered absurd .